anyone who knows me, knows I’m an early riser….the day starts about 4:30 here. My DH leaves for work at 4:45 and I like to get up to say goodbye to him in the morning. I have about 45 minutes in the morning all to myself before the kids have to get up and I have to get ready for work. So I try to squeeze in at least a stitch or two during that time each day. and little by little, things get done, or at least on their way to getting done. so I am very happy this morning to finish putting together the inside of my leftover 9-patch quilt. I had my doubts at first about the cheddar but one of the teenagers in the house told me “it makes the rest of the quilt pop” so I kept going with it. mmmm, I don’t know where he would have heard an expression like that…. I’m really supposed to starting something else…..but I think I will avoid that a little longer while I figure out some borders. 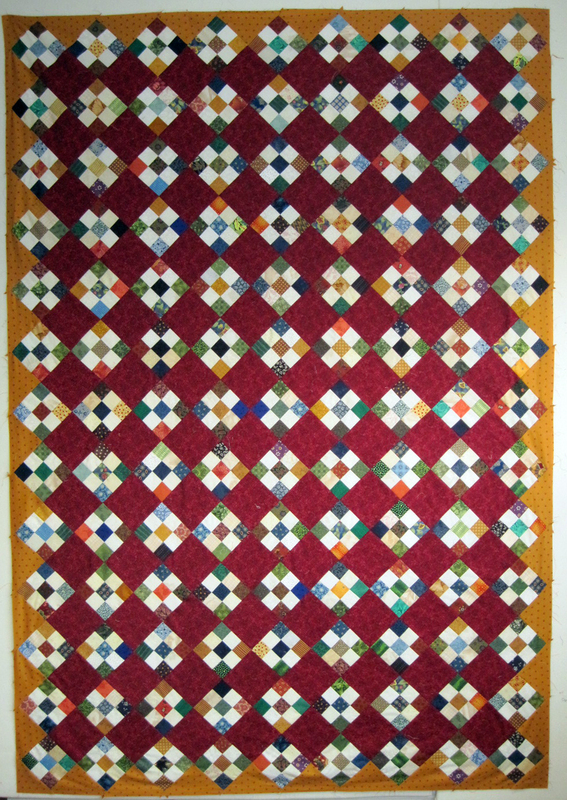 This entry was posted in Quilt in progress and tagged Quilt, Textile. Bookmark the permalink. Your kids were right! Love the red and cheddar! !